A young hippo has been shipped out of a Cape Town sewerage works, where he made his home after fleeing a nature reserve where he had clashed with his father. The four-year-old nicknamed “Zorro” fled the Rondevlei Nature Reserve outside Cape Town in February 2009 for the lush grass and abundant water of the Cape Flats Waste Water Treatment Works (CFWWTW). He got his nickname due to the zigzag scar on his back, caused by his father’s tusks during fighting. The Waste Water Treatment Works adjacent to Zeekoevlei and Rondevlei is part of the False Bay Coastal Park, a core area in the City’s Biodiversity Network. The hippos at Rondevlei are a keystone species in Rondevlei, one of the City’s 24 nature reserves. Thieves had made off with part of the reserve’s fence, creating an opening for 1 200-kilo Zorro to escape. Reserve staff put up an electric fence around 22 hectares to contain him around a water pan and baited a capture “boma” enclosure, said Dalton Gibbs of the city’s nature conservation department. Once Zorro had entered the capture boma, staff loaded him into a crate and moved him to his new home, a private reserve in nearby Worcester. 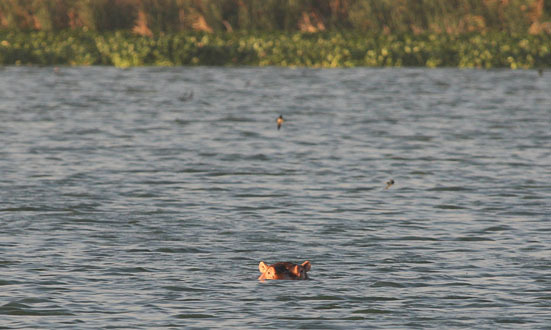 Zorro is not first hippo to have escaped from the Rondevlei Nature Reserve. In 2004 there was another escape artist, who was nicknamed … Houdini. This entry was posted in Africa, Wastewater Management and tagged Hippo Zorro, hippopotamuses, sewage works, South Africa. Bookmark the permalink.